Detailed Review of The Titan T3 Power Rack V2- With Video! 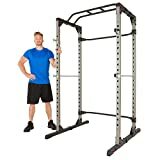 It’s highly unlikely you will see many racks with specs like the Titan T3 power rack for under $400, I have no idea how they produce such a great rack for this price but they do, and if you’re worried about build quality? Don’t! This rack is solid, sturdy and made from thick 11 gauge powder coated steel. All the Titan T3 Series V2 power racks feature the exact same specs/features i.e. all have the same weight capacities, frames gauges, and attachments. The only difference is the height of the rack and the depth between pillars so there’s no need to review all of the racks separately. Heres a comparison table of two T3 short racks Titan currently offer. The T3 is built from powder coated heavy duty 11″ gauge steel and weighs a hefty 230lb, being heavy makes this rack a little more difficult to assemble, but with weight comes stability and that’s just what you want from a home gym power rack, if you are not going to bolt this one to the floor the extra weight of the rack will help the T3 from tilting forward. loading the weight plate holders will also help keep the rack stable, be sure to load each holder with the same amount of weight each side for the right balance. 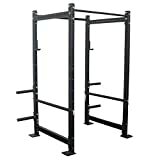 If you are going to train outside of the rack you can feel assured this rack will stay fairly stable compared to cheaper racks that weigh around the 100-150lb mark. The rack has four corner holes for bolting to the floor so if you can…do it, your stability will improve 10 fold for out of rack exercises. Industrial standard gauge for a power rack is 2″ x 3″ 11 -gauge steel. Anything less will have a lower weight capacity and stability. 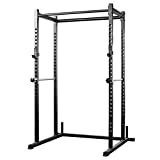 Cheaper racks typically have 12 -1 4 gauges and are not best suited to serious bodybuilders. Anything more than 11 is like training inside a tank which is great but comes at such a price it’s complete overkill for a home gym. 11 gauge is perfect for our needs and will support the 1100lb capacity with ease. With the Titan 3, you are getting hold of a commercial grade rack for an exceptionally low price, especially if you think this rack is almost an exact copy of the Rogue Fitness rack but at half the price, you really do start to understand how much you are getting for your money. Nearly all other power racks in this price range will be 2″ x 2″ and it’s awesome to see that the Titan T3 has the 2 x 3″ desired dimensions giving the frame a commercial rating! Hole spacing is more important than many people think, and it’s something everyone should take into consideration before choosing a power rack. Why is hole spacing important? Because the distance between the holes can affect your reach, level of comfort and range of motion when setting up exercises, an inch or two may not make much of a difference when you are setting up for a squat but can make a massive difference in pressing. Good racks do not exceed 2″ spacing and the best of the racks use a 1-1.5″ westside spacing scheme. Titan’s T3 rack thankfully has the desired westside spacing at 1″ for pressing levels and the rest is two inches. So pleased to see this in a $400 rack, impressive stuff from Titan! The Titan T3 is a heavy duty rack with a 1100lb weight capacity on the spotter bars. Some cheaper racks promise high capacities which I doubt many of them can take but the Titan T3 is built so well, with improved welds and heavy duty 2 “x 3” 11 gauge steel it should take the 1100lb with ease and a little more I guess but I wouldn’t risk it. There are not too many people who are going to lift over a 1100lb and I’m sure most of you can’t envisage lifting 1100lb and over. The weight capacity, durability and the huge array of attachments on offer for this rack should make buying this rack a lifelong purchase unless you are going to train outdoors with the rack, I see no reason why you would ever have to buy another rack. The rack’s depth, that’s the depth between the pillars, not the outside depth, will determine how much space you have for forward and backward bar travel, bodybuilding involves the use of arc movements such as curls and extensions so it’s best if we find racks with at least 24″ between the pillars. The T3 rack in this review has a depth of 24″ so a big thumbs up here, and if you need any more space there is the deep version with an extra 12″ pillar depth. But 24″ should be sufficient for our needs. Unfortunately, there are no dip bars included in the price of this rack, which is a shame, yes you are getting excellent quality and versatility here for the price point and I shouldn’t fuss about it, but I like to see dip bars included with any rack over the $300 mark. On the positive side, the great thing about this rack is all the accessories that fit the Rogue Fitness rack also fit the Titan rack and Rogue make some useful attachments at very reasonable prices. The rack does ship with weight plates holders, integrated weight plate storage helps keeps weights out of the way and keeps the weights easily accessible to the bar on the rack. Short angled Jay hooks also come with the rack as standard. Nice to see the rack is also supplied with 4 band pegs as standard, you can make full use of the holes in every tube of the frame, happily fitting the band pegs where you wish. The T3 rack comes standard with two pull up bars, most racks usually only provide the one so again Titan giving that little extra for your $’s, one bar is the standard 1″25, similar grip width to an Olympic barbell and the second is the 2″ thick grip bar, intentionally oversized, it will help improve your grip and get some size into those forearms. The rack comes with just about all you need for a free weight workout but there are a few accessories Titan sell to go with this rack that are worth a mention. It’s a good idea to take a close look at the dip attachments Titan offer for the T3 range. I’ve picked out two of the best, there’s four in total. Known as the upper body squat, dips are great for adding lower pec mass, if you are only going to buy one attachment then this is the one attachment I would say is definitely worthwhile paying out for. These parallel bars bolt into your rack and use a quick pin so you can easily adjust the width between the bars. Built to be compatible with 24″ deep Titan T-3 Power Racks. 1.9″ bar diameter, it’s recommended you bolt the rack to the floor first! Much faster to install than the parallel bars, with a quick change pin mounting system, the Y dip bars are an awesome piece of kit. Heavy duty steel construction, gusset plate make this Titan Y Dip an attachment that is as heavy duty as your rack. There a whole host of other attachments on offer including a multi-grip pull up bar, which is a great option to have as it lets you use just about any grip width you like and wrist position, it might just be worth buying for the corner grip position. Lastly, Titan offers a cable pulley system for the Titan T3, whilst not essential, it is something worth considering, the reason being cable pulley systems offer constant resistance unlike the variable resistance of free weight exercises. There are some constant resistance exercises you can’t duplicate with free weights like tricep pushdowns and side lateral raises, so if this is something you might need it’s always good to know you have this option with the T3. It’s much better choosing a rack and not needing the pulley, than choosing a rack and later on down the line you decide you need a cable pulley system but your rack doesn’t allow one, you would have to buy a separate cable pulley system or different rack. Zoey’s review of Titan Fitness T-3 Short Rack! Review - Titan T3 82"
Summary An excellent heavy duty rack, Westside hole spacing, 1100lb capacity and the versatility to add attachments as you grow and need them. The T3 rack surpasses all other racks in this price range.